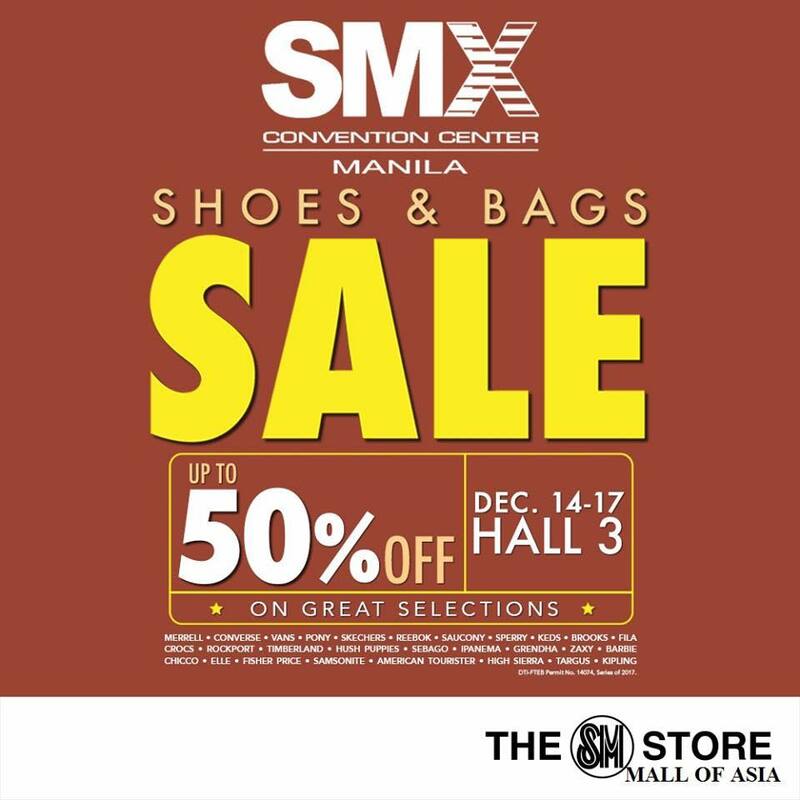 Check out the Shoes & Bags SALE happening simultaneously at SMX Convention Center MOA Complex, and SM North EDSA Skydome on December 14-17, 2017. Get up to 50% off on your favorite shoe, bag, and baggage brands! 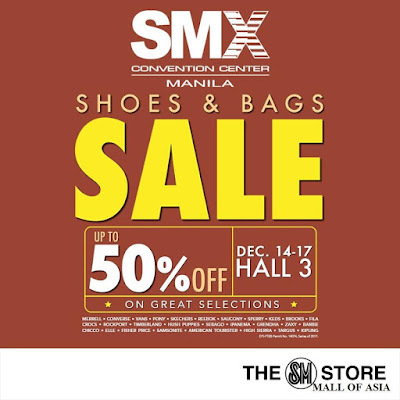 Participating brands at SMX Shoes & Bags Sale: Merrell, Converse, Vans, Pony, Skechers, Reebok, Saucony, Keds, Brooks, Fila, Corcs, Rockport, Timberland, Hush Puppies, Sebago, Ipanema, Grendha, Samsonite, American Tourister, High Sierra, Kipling, Targus, and more! 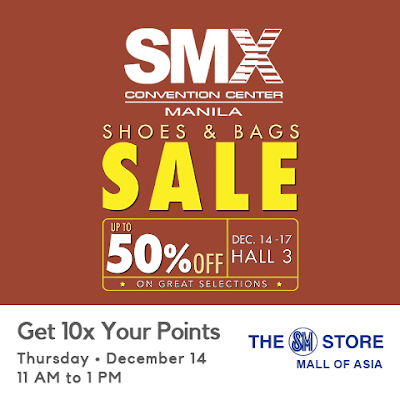 SM Advantage, SM Prestige, and BDO Rewards cardholders get 10x points on all items during the SMX Shoes and Bags Sale on Thursday, December 14, 2017, from 11 AM to 1 PM at the SMX Convention Center, Hall 3 in SM Mall of Asia. Participating brands at SM North Skydome Shoes & Bags Sale: Vans, Pony, Skechers, Merrell, Brooks, Fila, Asics, Hush Puppies, Sebago, Sperry, Keds, Barbie, Samsonite, American Tourister, High Sierra, Targus & more! 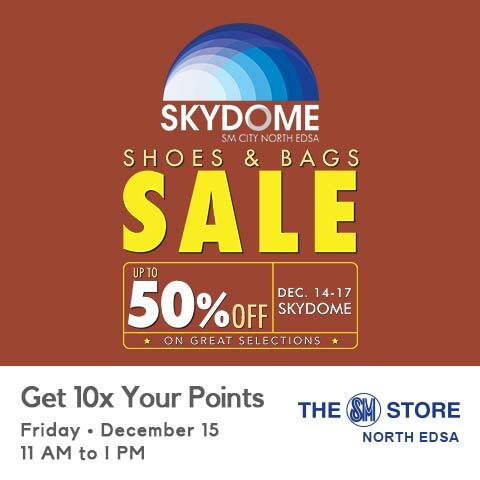 SM Advantage, SM Prestige, and BDO Rewards cardholders get 10x points on all items during the SM North Shoes and Bags Sale on Friday, December 15, 2017, from 11 AM to 1 PM at the SM North Skydome. I have a huge collection of bags and this is my passion which keeps me collecting new design of bags. 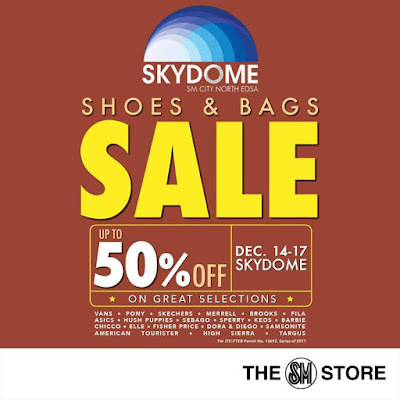 It is a good news for me that you have bag on sale.